Billy Dean Anderson (July 12, 1934 – July 7, 1979) gained notoriety in 1975 when he was added to the FBI Ten Most Wanted Fugitives list after a long list of crimes — for which he was jailed and paroled three times — including armed robbery and prison escapes, over the course of 20 years. Despite his unlawful behavior, Anderson became somewhat of a folk hero among those in his native Tennessee, even more so after he was shot and killed by FBI officers as he was leaving his mother's home one night after eluding federal authorities for four-and-a-half years. The FBI Ten Most Wanted Fugitives is a most wanted list maintained by the United States Federal Bureau of Investigation (FBI). The list arose from a conversation held in late 1949 between J. Edgar Hoover, Director of the FBI, and William Kinsey Hutchinson, International News Service editor-in-chief, who were discussing ways to promote capture of the FBI's "toughest guys". This discussion turned into a published article, which received so much positive publicity that on March 14, 1950, the FBI officially announced the list to increase law enforcement's ability to capture dangerous fugitives. Tennessee is a state located in the southeastern region of the United States. 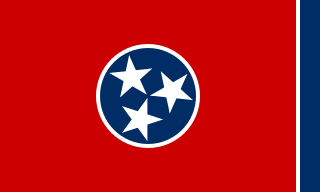 Tennessee is the 36th largest and the 16th most populous of the 50 United States. Tennessee is bordered by Kentucky to the north, Virginia to the northeast, North Carolina to the east, Georgia, Alabama, and Mississippi to the south, Arkansas to the west, and Missouri to the northwest. The Appalachian Mountains dominate the eastern part of the state, and the Mississippi River forms the state's western border. Nashville is the state's capital and largest city, with a 2017 population of 667,560. Tennessee's second largest city is Memphis, which had a population of 652,236 in 2017. Anderson was born in the Pall Mall area of Fentress County, Tennessee, the same Wolf River valley where World War I hero Alvin C. York hailed. Little is known about his early life. While this is reported in many articles the FBI disputes these claims and his birthplace has been unconfirmed. He attended Rotten Fork Elementary School, where he preferred to fill his notebooks with sketches rather than homework. However, he was believed not to have been a troublesome youth,  and volunteered as a preacher at Wolf River Methodist Church in Pall Mall at age eighteen. He used the aliases 'Billie Dean Anderson' 'James Forster' and 'William David Upchurch'. He had a stocky build and stood at 5'8" and weighed between 160 and 170 pounds with fair skin and bluish-green eyes. He worked as an artist, mechanic, unskilled laborer, tree surgeon and farmer. Anderson was severely marked with a scar across the bridge of his nose, the left side of his forehead, a surgical scar on the right side of his stomach and another surgical scar on his lower spine. He reportedly wore braces on both of his legs and suffered from atrophy of the legs. Pall Mall is a small unincorporated community in the Wolf River valley of Fentress County, Tennessee, United States. Pall Mall is located near the Kentucky-Tennessee state-line in northeastern-central Tennessee. The population was at 1,398 people according to the 2000 census. Fentress County is a county located in the U.S. state of Tennessee. As of the 2010 census, the population was 17,959. Its county seat is Jamestown. The Wolf River is a 40.3-mile-long (64.9 km) river in the U.S. states of Tennessee and Kentucky that rises at the base of the Cumberland Plateau in Fentress County, Tennessee and flows westward for several miles before emptying into the Obey River at the Dale Hollow Reservoir. The river is part of the Cumberland River drainage basin, and flows primarily in Middle Tennessee and southern Kentucky. Via the Cumberland and Ohio rivers, it is part of the Mississippi River watershed. It is not to be confused with the Wolf River of West Tennessee which flows into the Mississippi at Memphis. In June 1959, Anderson and two friends held an armed robbery at a drive-in theater in Jamestown, Tennessee. When the theater usher revealed he possessed little money, Anderson intentionally missed while shooting near him. The three men managed to evade police, however were arrested the following morning while engaged in a police standoff while inside the Wolf River Methodist Church in Pall Mall. Anderson served a four-month jail sentence, as his lenient sentence was due to being a first-time offender. A drive-in theater or drive-in cinema is a form of cinema structure consisting of a large outdoor movie screen, a projection booth, a concession stand and a large parking area for automobiles. Within this enclosed area, customers can view movies from the privacy and comfort of their cars. Some drive-ins have small playgrounds for children and a few picnic tables or benches. In October 1962, Anderson brandished a shotgun on a group of state police troopers in Jamestown, which escalated to his shooting an officer. Anderson decided to surrender when a bullet grazed his head, and he was shot twice in the stomach. Anderson received a ten-year prison sentence, and only served four years due to being a model prisoner. At the recommendation of a lawyer, Anderson moved to Muncie, Indiana, in order to leave Tennessee. However, he received a suspended prison term for armed robbery/assault in Muncie, and was banished from the state. When he returned to Tennessee, he was involved in a standoff with the sheriff and a deputy sheriff in Fentress County, and served four years of two consecutive seven-year prison terms. 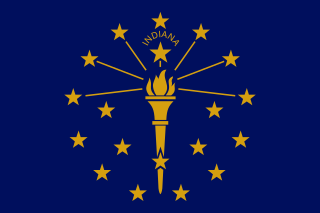 Muncie is an incorporated city and the seat of Delaware County, Indiana. It is located in East Central Indiana, about 50 miles (80 km) northeast of Indianapolis. The United States Census for 2010 reported the city's population was 70,085. It is the principal city of the Muncie metropolitan statistical area, which has a population of 117,671. Parole is a temporary release of a prisoner who agrees to certain conditions before the completion of the maximum sentence period, originating from the French parole. The term became associated during the Middle Ages with the release of prisoners who gave their word. Pickett County is a county located in the U.S. state of Tennessee. As of the 2010 census, the population was 5,077, making it the least populous county in Tennessee. Its county seat is Byrdstown. Moonshine was originally a slang term for high-proof distilled spirits that were usually produced illicitly, without government authorization. In recent years, however, moonshine has been legalized in various countries and has become a commercial product. According to an FBI release, Anderson's whereabouts was tipped to them by an informant they called the "Mountain Man". This tip led to the death of Anderson as he was leaving the home of his 75-year-old mother in the early hours of July 7, 1979. As he had attempted to run away from the state troopers, he was shot twice in his lower back. 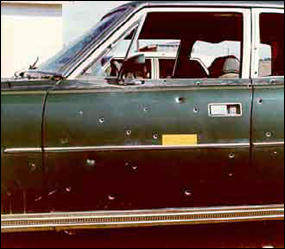 The bullet exited through his stomach and Anderson died immediately as a result of his wounds. Anderson was a sympathetic figure to many in the area, which had a long history of violence around moonshine stills and logging camps. Of the five other fugitives placed on the FBI Most Wanted Fugitives List in 1975, Anderson eluded federal authorities for the longest period. His nearly four-and-a-half years on the list were longer than all but nine of the more than 60 placed on the list during the 1970s. What is not legend is that Anderson was a gifted painter. While in prison he produced over 300 paintings, most of them were idealized versions of a muscular Christ. He was also an accomplished woodcarver. Brushes and paint were found in his cave hideout in Pickett County. Mutulu Shakur is an American activist and former member of the Black Liberation Army, sentenced to sixty years in prison for his involvement in a 1981 robbery of a Brinks armored truck in which a guard and two police officers were killed. George Kelly Barnes, better known by his nickname "Machine Gun Kelly", was an American gangster from Memphis, Tennessee, during the prohibition era. His nickname came from his favorite weapon, a Thompson submachine gun. He is most well known for the kidnapping of oil tycoon and businessman Charles F. Urschel in July 1933, from which he and his gang collected a $200,000 ransom. 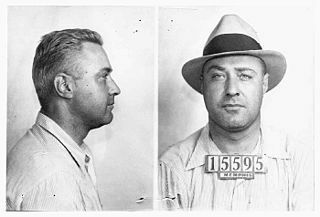 Urschel had collected and left considerable evidence that assisted the subsequent FBI investigation which eventually led to Kelly's arrest in Memphis, Tennessee, on September 26, 1933. His crimes also included bootlegging and armed robbery. 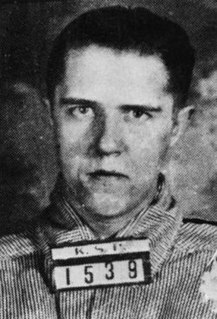 William Kenneth (Kinnie) Wagner commonly known as Kinnie Wagner was a bootlegger in Mississippi, who murdered five people, including three lawmen. He escaped from custody numerous times, but ultimately died in prison. A shootout, also called a firefight or gunfight, is a gun battle between armed groups. A shootout often, but not necessarily, pits law enforcement against criminal elements; it could also involve two groups outside of law enforcement, such as rival gangs. A shootout in a war-like context would usually be considered a battle, rather than a shootout. Shootouts are often portrayed in action films and Western films. Clayton Lee Waagner is a convicted bank robber and anti-abortion terrorist. He was born Roger Waagner in North Dakota. He was an escaped fugitive during the spring, summer and fall of 2001 and was the FBI's 467th fugitive to be placed on the Ten Most Wanted list for carjackings, firearms violations, and bank robbery on September 21, 2001. He was placed on the United States Marshals Service Top 15 Fugitives list for sending more than 280 letters that claimed to contain anthrax, which he mailed to Planned Parenthood with return addresses of the Marshals Service and the Secret Service beginning in October 2001. He is currently in prison. In 1952, the United States FBI, under Director J. Edgar Hoover, continued for a third year to maintain a public list of the people it regarded as the Ten Most Wanted Fugitives. In 1963, the United States FBI, under Director J. Edgar Hoover, continued for a fourteenth year to maintain a public list of the people it regarded as the Ten Most Wanted Fugitives. Leroy David "Lee" Baca is a former sheriff of Los Angeles County, California, and a convicted felon. John Parsons is a criminal from Chillicothe, Ohio. Prior to his capture on October 19, 2006, he was an FBI Ten Most Wanted Fugitive wanted for unlawful flight to avoid prosecution, escape, aggravated murder, aggravated robbery, weapons under disability, tampering with evidence and grand theft. Fleet Robert Current was an American bank robber and listed on the FBI's Ten Most Wanted list in 1953. Gilbert James Everett was a Kansas bank robber whose crime spree in the Southeastern United States during the early 1980s resulted in his being listed on the FBI's Ten Most Wanted list for over four years. Emigdio Preciado Jr. is an American criminal, gang member and a former fugitive who was added to the FBI's Top Ten Most Wanted Fugitives list on March 14, 2007. Preciado is the 485th fugitive to be placed on the list. Sgt. Alvin C. York State Historic Park is a state park in Pall Mall, in the U.S. state of Tennessee. Situated along the Wolf River, the park contains the farm and gristmill once owned by decorated World War I soldier Alvin C. York (1887–1964), who lived in the Pall Mall area for his entire life. Along with the millhouse and milldam, the park includes York's two-story house, York's general store and post office, the Wolf River Cemetery, the Wolf River Methodist Church, the York Bible Institute, and various picnic facilities. John Allen Kendrick was an American criminal, escape artist, bank robber and member of the Tri-State Gang whose career spanned four decades. He was listed on the FBI's Top Ten Most Wanted in late 1955, and was apprehended by the FBI that same year. Sam Thomas "Tommy" Burnett was a Tennessee politician who was Majority Leader of the Tennessee House of Representatives and who served two prison sentences for separate federal convictions. The Barker–Karpis Gang was one of the longest-lived criminal gangs during the Depression Era, spanning from 1931 to 1935. The gang was founded by Fred Barker and Alvin Karpis, and later joined by Fred's brother Arthur "Doc" Barker. Along with the three core members, the gang's network spanned up to 25 members at one point. The Fentress County Sheriff's Office (FCSO) is the primary law enforcement agency in Fentress County, Tennessee. The FCSO is responsible for patrolling the 499-square miles of the County and its 17,000+ residents. The FCSO currently employs 20 sworn full-time law enforcement officers, 7 part-time sworn officers and over 20 Correctional Officers. The current Sheriff of Fentress County is Michael Reagan. 1 2 Dickinson, W. Calvin and Michael E. Birdwell (2004). Rural Life and Culture in the Upper Cumberland. The University Press of Kentucky. p. 268. ISBN 978-0-8131-2309-7.